Traces – Unravelling the Cold War in Southeast AsiaThe ﬁftieth anniversary of the start of the ʻunﬁnishedʼ Korean War has coincided with a series of realignments in Southeast Asia, as states jostle for position in anticipation of the close of one of the last remaining businesses of the Cold War. Recent talks between the Defence Ministers of North and South Korea – on opening up transportation links across the demilitarized zone that separates the two states – follow recognition of the prospect of ʻeventual reuniﬁcationʼ. In June, South Korea lifted its decades-long ban on Japanese cultural imports; while Taiwan has been challenging Japan to stand up to China and respond to overtures from Taipei. However, memories of Japanese colonialism remain strong. The retreat of Cold War priorities presages the re-emergence of the traces of earlier conﬂicts. One side effect of this situation is the reconﬁguration of East Asian Studies in the USA, as the disciplinary paradigm of area studies struggles with the new spatial, political and intellectual realities of the post-Cold War world. At the forefront of this development is a new twice-yearly journal, Traces: A Multilingual Journal of Cultural Theory and Translation, forthcoming in December, each issue of which is due to appear in Chinese, English, German, Japanese and Korean. However, Traces aims to be much more than just a journal of Southeast Asian Studies. According to its Statement of Purpose, it hopes ʻto initiate a different circulation of intellectual conversation and debate in the world, a different geopolitical economy of theory and empirical data, and a different idea of theory itself.ʼ So far, at its ﬁrst three conferences, in Tokyo, Beijing and, most recently (September 2000), Seoul, it has tried to do this through rethinking the tropes of ʻtranslationʼ, ʻthe Westʼ, and ʻmodernityʼ. How well it succeeds may well depend upon its ability to grapple with the traces of its own formation. The English language edition of Traces is published by Traces, Traces Editorial Ofﬁce, 388 Rockefeller Hall, Cornell University, Ithaca, N.Y. 14853 USA E-mail: traces@cornell.eduCharter individual subscriptions (received by 1 May 2001) $20; Individual subscriptions $26; Institutional subscriptions $75; Single issues $14. 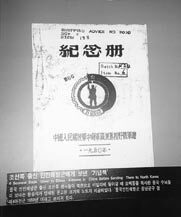 Non-US subscriptions add 15%.Text welcoming (and bidding farewel ) to visitors at the exhibition commemorating the Fiftieth Anniversary of the Korean War, War Memorial museum, Seoul, 2000.